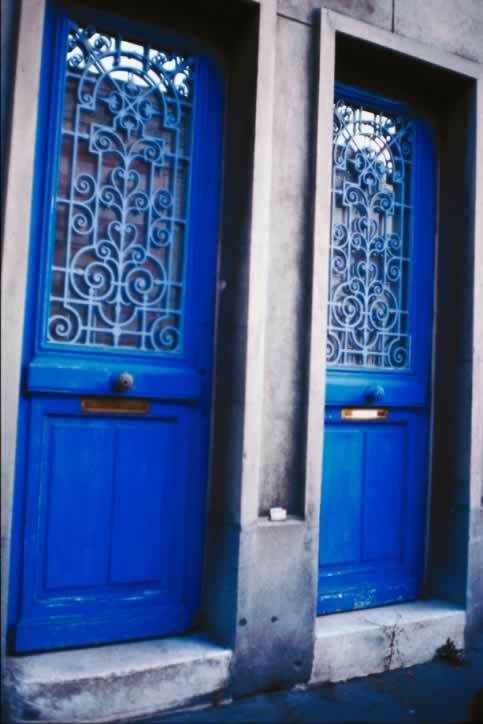 This pair of two-toned blue doors give an extra punch of color to this building's gray, urban fa��ade. Each door is framed with two panels. The top panel is a window (also called a lite when it's a window in a door). The bottom panel is raised, but the raised part is split into two vertical rectangles. The glass in the lite is clear, which does not offer homeowners much security or privacy by itself. The addition of an ornate wrought iron grille helps to protect the glass and protect the home from someone breaking the glass to unlock the door. The metalwork has been painted a light color of blue. The rest of the door has been painted a darker shade of blue. Both doors have antique door bells on their mid rails; however, the door bell on the right has been painted over.